Last week at the Open Compute Project (OCP) Summit in San Jose, Samsung's booth included a surprise appearance of a Z-SSD in the M.2 form factor. Samsung has been pitching their Z-SSD SZ985 using Z-NAND memory as a low-latency competitor to Intel's 3D XPoint-based Optane SSDs. The Z-SSD SZ985 has made many trade show appearances over the course of its development, but always in the form of a half-height half-length PCIe add-in card. That card keeps all the interesting components covered by a heatsink, leaving us with little indication of the PCB's layout, but some of Samsung's earlier presentations included renderings showing a very large SSD controller, similar in size to a typical 16-channel controller. Samsung's exhibit at the OCP Summit included a M.2 version of the SZ985, revealing that the controller is in fact the same Phoenix 8-channel controller used on Samsung's other 98x SSDs, including the PM981 client SSD. This controller is also very likely to be used in Samsung's next generation consumer retail NVMe SSDs, the successors to the 960 PRO and 960 EVO. Samsung's exhibit called the drive the SZ985 Z-SSD, but the stickers on the drive say SZ983. The capacity of the demo unit appears to be 240GB, the same as the smaller capacity announced earlier this year when the Z-SSD SZ985 officially launched. Samsung's display also listed a 480GB capacity, likely the most first-generation Z-NAND that Samsung can fit onto the M.2 card. The development of a M.2 Z-SSD raises the possibility of Samsung introducing a Z-SSD for the enthusiast consumer market, to compete against the Intel Optane SSD 800P. 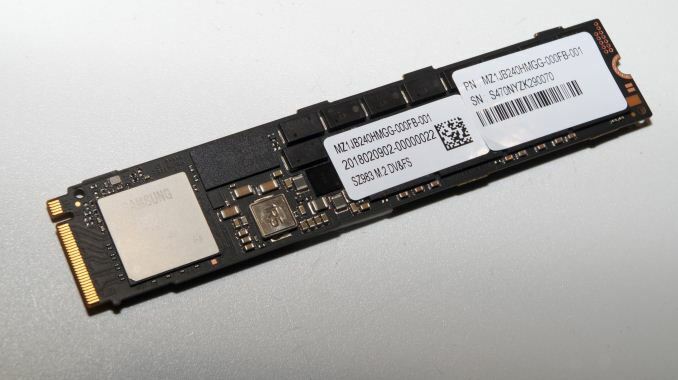 However, it is likely that Samsung can remain quite competitive in the high-end consumer SSD space with another conventional MLC-based SSD to replace the 960 PRO. Sacrificing further capacity for incremental performance gains would probably not be worthwhile, even though a Z-SSD doesn't go as far down that road as Optane SSDs. What we need right now isn't faster SSD, it is cheaper SSD. Those M.2 variant are still expensive. I've been able to get a Micron 1100 2TB for$360CAD ($280USD) this week.